Peter Goehle arrived in New York City on August 25, 1873 on the Batavia which sailed from Liverpool, via Queenstown, Ireland. There were 338 passengers in steerage on that trip. The Batavia sailed for the Cunard Lines. Build by Wm. Denny & Bros., Ltd., Dumbarton, Scotland. Tonnage: 2,553. Dimensions: 327' x 39'. Single-screw, 12 knots. Compound engines. Two masts and one funnel. Iron hull. Clipper bow. Passengers: 150 cabin, 800 third. Maiden voyage: Liverpool-New York, May 10, 1870. Taken in trade as part payment for Umbria and Etruria in 1884 by John Elder & Co. Triple expansion engines in 1885. Speed increased to 14 knots. Ran for Canadian Pacific Line in 1887. 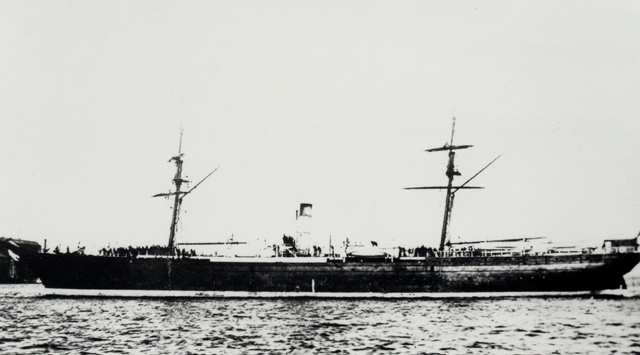 Renamed (a) Tacoma (1892), (b) Shikotan Maru (1913). Wrecked in 1924; dismantled for scrap. Running mate: Parthia.